YIshai is joined by soldier, artist, father, and activist Marc Prowisor. Prowisor, who is also the director of security projects the One Israel Fund, talks with Yishai about a party held by Arabs, to celebrate deceased leader Yasser Arafat held near the Mount of Olives studio. They also discuss what is going on among Arabs inside of Israel. Yishai is joined by Knesset insider Jeremy Saltan to talk about the situation in the government including the dissolving of the Likud-Beiteinu coalition and also preparing for an operation in Gaza. Yishai Fleisher talks to Zvika Klein, award-winning journalist covering the Diaspora beat for Makor Rishon and NRG, about the shocking reality of Jews living in refugee camps in Ukraine's war zone. Also Gil Hoffman, VOI broadcaster and Chief Political Correspondent for the Jerusalem Post recounts the plight of another long-suffering Jew, Jonathan Pollard. Yishai hears from the politician from the Kulanu party about her 90-year-old grandmother's move today from the US to Israel. MK Rachel Azaria, a former deputy mayor of Jerusalem, describes the journey her grandmother made by immigrating to Israel as one of the 221 new immigrants who arrived today on a Nefesh B’Nefesh flight. Yishai presents a speech given by David Sacks of the Happy Minyan which discusses preparations for the Month of Elul. The worsening housing crisis, the worsening Iran crisis and other problems that Israeli politicians can't seem to solve -- and with Knesset elections taking place a mere two years after the previous ones -- are causing many Israelis to be cynical about the political process. The voter has a desire to see something different, but will they be disappointed again? Dr. Seth Frantzman, op-ed editor of the Jerusalem Post, joins Yishai in-studio to discuss the state of the Israeli electorate. How can the most famous man in history also be the most humble? Why are we commanded to remember to destroy the memory of Amalek (Israel's arch nemesis)? These and other conundrums are the topics of discussion between Rabbi Mike Feuer and Yishai on the segment that gets you ready for Shabbat. From comfort of Boca to the power of DC, to the speed of New York to the glitz of the City of Angels, Yishai is on the road in the US promoting a strong Israel, telling people about the death of Two State idea, and a connecting folks to the Biblical heartland! Yishai plays recordings from the month-and-a-half he and his wife, Malka, spent broadcasting from Gush Katif during the 2005 disengagement. The Fleishers provided their priceless, on-the-scene perspective of one of the most dramatic moments in Israeli history, as they observed the communities’ valiant refusal to leave their homes — even as their towns were cut off from food and supplies — while being intimidated by the Israeli government. Yishai and Malkah discuss his father's yahrzeit, the approval of Jewish housing in Jerusalem, and Canadian singer Alanis Morissette in Israel. Ambassador Dermer's thoughts on what is ahead in the coming years between Israel and the USA. Yishai and alternative peace activist Baruch Widen discuss upcoming peace talks and relate them to two issues of Time magazine brought into the studio by Widen. Yishai is joined by Shai Ish-Shalom, former member of Sayeret Matkal, the most elite unit in the Israel Defense Forces. They discuss Ish-Shalom's personal experience in Entebbe, Uganda and also talk about Jewish defense in both Israel and the Diaspora. Yishai presents an awesome show where he speaks with author, law professor, and human rights activist, Thane Rosenbaum, freshman US congressman Brian Mast, and Finally, Dr. Owen who is a top oncologist on sabbatical in Israel. Yishai interviews new Oleh Chaim Messer along with Hassidim on their way to Meron for Lag B'Omer. Michael Ganoe, a man of conviction and principle, left Washington DC to fight for the freedom, sovereignty and security of Israel. He is the founder of Insight to Israel and Hersheys for Heroes - bringing Hershey bars to Israeli soldiers with a message from America - we are with you! Then, Uri Regev is a lawyer and rabbi and civil rights and religious pluralism advocate. Currently Regev serves as the President and CEO of 'Hiddush – For Freedom of Religion and Equality,' a trans-denominational nonprofit organization aimed at promoting religious freedom and equality in Israel. Yishai and David Nekrutman of the Center for Jewish-Christian Understanding and Cooperation discuss the need for interfaith dialog between Jews and Christians in Israel. Yishai showcases the life of the legendary Rabbi Ovadia Yosef (z’l) at the sad time of his passing and talks about what it was like to be at Rabbi Yosef's funeral. Yishai and Malkah discuss threats to Israel from both Hizbullah and Syria and how gas masks are being issued to Israelis. They move on to talk about how despite reports in the international media that states otherwise, Aliyah to Israel has barely been affected. Yishai and Malkah talk about the prisoner release, a harsh stance from the US State Dept, and present audio from the most recent Nefesh B'Nefesh flight arrival in Israel. Yishai and Malkah talk about Tisha B'Av in Jerusalem along with the recent visit of American presidential hopeful Mitt Romney's trip to Jerusalem. One, Two, or Three States? Yishai is joined by Baruch Widen to discuss recently-broadcast pieces on Al Jezeera that discuss the future of Israel and its neighbors. Yishai and family are at Neve Ilan celebrating the Holiday of Liberation with a visit to Hebron and the Priestly Blessing in Jerusalem. 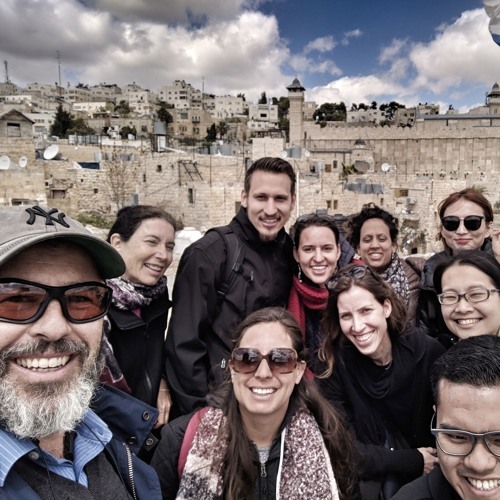 Join Yishai as he talks with a group of Christadelphians - non-Jewish lovers of Israel. Happy Pesach! Yishai presents audio on the Palestinian statehood bid along with the situations in Syria and Iraq. Yishai is joined, via phone from Bankok, by Chabad Rabbi Nechemia Wilhelm, who is in touch with Rabbi Chezki Lifshitz and his wife Chani, serving in Nepal. They discuss how Chabad, an organization that provides Jewish services to locals and travelers all over the world, is dealing with the fallout of the massive earthquake and avalanches that have plagued the region. Then, Yishai makes an impassioned plea to the next education minister to create "San Remo Day." He says that very few people are aware that April 25, 1920 was crucial in the international legal standing for the establishment of the state of Israel nearly three decades later. Finally, Yishai is joined in-studio by Jerusalem Post op-ed editor Seth Frantzman and editorial page editor Matthew Wagner to discuss the earthquake in Nepal, a place with which Israelis have a special connection.